(March 20, 2010 - Newton, NC) The opening night for the NASCAR Whelen All-American Series kicked off the 59 th consecutive season of racing at America's Most Famous Short Track, Hickory Motor Speedway. 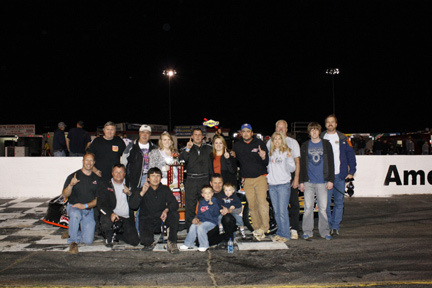 It was a night of racing for the history books as Dexter Canipe Jr., driver of the No. 5 Advance Auto Parts Limited Late Model and the No. 5 Bojangles Late Model, had a clean sweep taking home the checkers in both events. “We are blessed to be in victory lane again,” exclaimed Dexter Canipe Sr., as his son rolled into victory lane for second time during the season opener. The night not only included events for the Bojangles Late Models and Advance Auto Parts Limiteds, but fans also got to witness the racing action of the Everything Attachments Super Trucks, the Hickory Street Stocks and the Hickory 4-Cylinders. 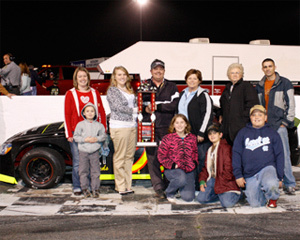 The Bojangles Late Models began their 2010 season with a special 100 lap feature event. The No. 88 of Kyle Mansch, 2009 Advance Auto Parts Limited Late Model Champion, started his season off right by taking the pole after posting a 15.260 second qualifying lap. Mansch held on tight to his lead until lap 11, when the No. 43 of Jesse LeFevers squeezed to the inside as the two raced into turn four. The move by LeFevers got Mansch loose, sending him for a spin. The No. 10 of Andy Mercer, the No. 19 of Kyle Moon, the No. 51 of Josh Wimbish and the No. 92 of Candace Muzny made contact with Mansch, bringing out the first caution. LeFevers had a great restart and quickly pulled away from the field. The No. 36 of Neil Meredith was on a mission as he worked his way through the field, moving into the second place spot by lap 15. A second caution fell on lap 21 after Mercer spun around on the exit of turn three. After the restart, Moon found great luck on the historic short track, taking over the lead on lap 29. The No. 5 of Dexter Canipe Jr. was on fire as he took over the second place spot on lap 45, after landing a tough ninth place starting position. On lap 47 LeFevers pulled into the pits, due to mechanical issues, bringing his night to an early end. Mercer, 2009 Track and Late Model Champion, moved into the top five after a rough night on the track on lap 52. The No. 3 of Jessica Brunelli, developmental driver for Revolution Racing, put on a great show working her way into the top five at the half way mark of the feature. With 40 laps remaining, Moon appeared to be putting on a clinic as he managed a half track lead over the field. The worst situation possible presented itself to Moon on lap 65 as he pulled into the pits with a flat tire, leaving Canipe Jr. to take over lead. Muzny managed to bounce back from the damage she received earlier in the race, as she worked her way up to the fourth place position on lap 77. 20 laps remained and Meredith was putting the pressure on Canipe Jr. Meredith was looking for any opportunity to move into the lead, as he searched for his first Hickory Motor Speedway late model win. The third and final caution fell on lap 84, Mercer got into the back of the No. 22 of Toby Parese, sending Parese for a spin into the turn three wall. Canipe Jr. got a bit loose on the restart as the field headed down the back stretch, but he was able to hold on tight and straighten out his ride. Meredith was forced to get out of the gas to avoid making contact with Canipe Jr., causing him to lose momentum and his run on Canipe Jr.
Canipe Jr. held off the field taking home his second trophy of the evening. Meredith, Brunelli, Muzny and the No. 99 of Mike Darne rounded out the top five. 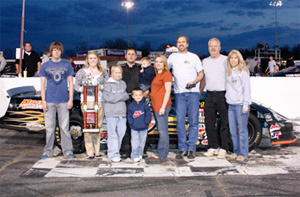 The Advance Auto Parts Limited Late Models kicked off the 2010 NASCAR Whelen All-American Series racing season off right as they took to the track for their 35 lap feature event. The No. 14 of Brandon Cox started the race in the pole position, looking for his shot at a win. Cox was quick to fall off the pace, allowing the No. 28 of Jason Crouse to pull into the lead on the first lap, bringing with the No. 35 of Chris Lewis for second and the No. 5 of Dexter Canipe Jr. for third. The first caution of the event came out on lap four, when the No. 45 of Kenneth Pardue experienced mechanical issues and slapped the front stretch wall. It didn't take long for a second caution to fall as the No. 15 of Sheflon Clay and the No. 97 of Brandon Lynn connected on the front stretch during the restart. Canipe Jr. was on a run, moving into the second place position on lap eight. After capturing the position, Canipe Jr. put his bumper to Crouse as he looked for an opportunity to move into the lead. The third and final caution of the race waved when the No. 8 of Mark McIntosh, the No. 8 of Hunter Bledsoe and Cox, got together heading into turn one. That caution was the break Canipe Jr. was looking for to put him in prime position to take the lead away from Crouse. On lap 18, Canipe Jr. captured the top spot and the checkered flag, leaving Crouse to settle for second. “Man, Jr. is some tough competition,” Crouse stated during his post race interview. Lewis, the No. 07 of Tyler Church and the No. 11 of rookie Matt Piercy rounded out the top five. The Hickory Street Stocks hit the track for 30 laps of excitement as the pole sitter, No. 1 of Taylor Stricklin, led the field around the historic short track without incident for the first five laps. The first caution waved on lap six as the No. 03 of Kevin Eby and the No. 7 of Jeff Sparks connect heading out of turn four. The contact cut down tires on both cars, causing Sparks to stop on the backstretch. The second caution was quick to fall as the No. 52 of Jonathan Goodwin spun heading out of turn three collecting the No. 35 of David Werner and the No. 00 of Jim Mayberry. The red flag was brought out on lap nine when Sparks and the No. 9 of Charlie Watson made contact on the exit of turn four. Sparks went for a 180 degree spin on the front stretch collecting Watson, sending him hard into the front stretch wall. The excitement continued when the No. 21 of Roger Pitts II got his nose under the bumper of seasoned Hickory Motor Speedway veteran driver, the No. 64 of Marshall Sutton, to take over the third place spot on lap 19. Stricklin brought the field to the checkers for the win, with Pitts in tow. After his early race mishap, Eby was on a mission to make it back to the front of the field, working his way into the third place spot. Sutton and the No. 25 of Jeremy Pelfrey completed the top five respectively. The Everything Attachments Super Trucks kept things clean during their caution free race. The No. 68 of Michael Cooper had a fast truck and showed major dominance as he maintained his lead during the entire 35 lap event. 10 laps in, the No. 11 of Thomas Beane was glued to the bumper of the No. 6 of Brandon Setzer. Beane remained patient as he looked for any opportunity to take over the fifth place position. Bean was able to get his nose under Setzer on lap 15, completing the pass to take over the fifth place position leaving Setzer to settle for sixth. The No. 98 of Jody Measmer, the No. 16 of Clint Fields and the No. 69 of Trevor Hignutt came home with second, third and fourth place finishes. 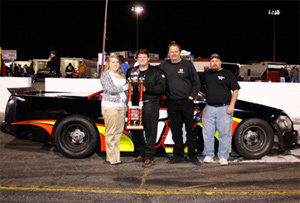 The Hickory 4-Cylinders brought the 2010 NASCAR Whelen All-American Series season opener to a close as the seven car field made its way onto the track for a 20 lap event. The No. 09 of Randy Canipe was quick to grab the lead from the No. 4 of pole sitter, Adam Beaver. Beaver stayed glued to the bumper of Canipe as he patiently looked for his chance to move back out front. On lap seven, Beaver shot under Canipe as they raced into turn three, regaining his lead on lap eight. The first and only caution of the race came out on lap 22 when the No. 51 of Nathaniel Kanupp experienced mechanical issues and tapped the outside wall. Only three laps remained as the 4-Cylinders went back to green flag racing. Canipe moved back into the lead at the restart, but Beaver stayed closely behind. There wasn't enough time for Beaver to move back out front, leaving him to settle for a second place finish. The No. 16 of Randy Freeze, the No. 98 of Rob Lewis and the No. 59 of Don Wardo completed the top five. The racing action will continue over the next seven day at Hickory Motor Speedway as we host the USAC Mopar Nationals & Ford Focus Midgets on Wednesday, March 24 and Thursday, Mach 25. For more information about the USAC event, fans can visit their website at www.usacracing.com . The NASCAR Whelen All-American Series will be back again next Saturday, March 27. The night will feature the Bojangles Late Models, the Advance Auto Parts Limiteds, the Everything Attachments Super Trucks, the Hickory 4-Cylinders, the Hickory Street Stocks and the Red Baron Race Parts Hobby Stocks. Grandstands open at 5PM with qualifying immediately following. An On Track Autograph Session will take place at 6PM, with feature racing action starting at 7PM. 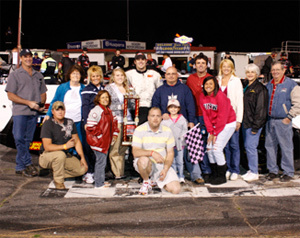 For more information about the 2010 season events at Hickory Motor Speedway, fans can visit www.hickorymotorspeedway.com .